Four kidnappers discover the young woman they are holding for ransom is possessed by a dangerous demon. 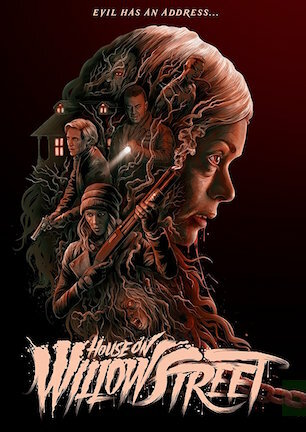 After six weeks of planning, Hazel, Ade, Mark, and James kidnap Katherine Hudson, although they are surprised to find the Hudson home on Willow Street in a strange state when they take her. Hazel, Ade, Mark, and James hold Katherine captive in an empty warehouse. They record a video ransoming Katherine for her family’s diamonds, but are strangely unable to contact Katherine’s parents. Ade and James are sent back to the house on Willow Street to find out what happened. Katherine tells Hazel that she should be freed or else everyone will die. Hazel is shocked when Katherine sings a song from her childhood. Katherine also reveals that she knows Hazel’s parents died in a house fire where Hazel was the only survivor. At the house on Willow Street, Ade and James find two priests dead in the basement and Katherine’s parents dead in their upstairs bedroom. Ade and James flee the scene after Ade confronts a horrifying vision of Georgie, a family member whose death he blames himself for. Ade confronts another vision of Georgie in the road, causing his and James’ van to overturn. Back at the warehouse, Mark encounters a haunting vision of his daughter Sarah. Hazel has a vision of her mother and the fire. James climbs out of the overturned van and faces a vision of his dead mother, who attacks him with an elongated tongue. Ade finds James and helps carry him back to the warehouse. While James, frothing at the mouth, is isolated in another room, Ade reports what happened at the house to Hazel and Mark as everyone discusses their various visions. To find out what happened, Ade, Hazel, and Mark watch videos recovered from Katherine’s house. Katherine’s video diary reveals that the house on Willow Street has a long history of strange deaths. Ade and Mark are surprised to learn that Hazel once lived in the house, which is where her parents died in the fire, and that Hazel’s father John was business partners with Mr. Hudson, which is how Hazel knew about the diamonds. Katherine traces the tragedies to a demon who devours tormented souls and will target anyone in the house who is in a state of grieving. Katherine says she was targeted by the demon because of a recent, secret abortion. In another video, two priests explain to Katherine’s parents that the Willow Street house is a hotspot for evil because it is located at the furthest point on Earth away from where the Vatican houses a rare Bible manuscript said to have been written by God himself. They elaborate that the demon that possessed Katherine brings a person’s worst nightmares to life, and needs to consume four souls, one for each corner of Hell where it is trapped, to take its true form. The only way to stop the demon is to burn the first person possessed, but the priests are killed before they can destroy Katherine. Ade, Hazel, and Mark agree to call the cops and abandon Katherine in the warehouse just before seeing James levitate. The trio flees and confronts Katherine in a state of possession. Mark stays behind to face Katherine while Hazel runs after Ade. Katherine attacks Mark and threatens to kill him unless he agrees to give her two more souls. Ade confronts another vision of Georgie before facing James in a state of possession. Ade shoots at James. Hazel regroups with Ade only for Mark to take them both at gunpoint. Mark gives over Hazel and Ade to Katherine. Katherine supernaturally levitates both of them when Mark has a sudden change of heart. Mark begins strangling Katherine with a chain while Hazel and Ade run. Katherine attacks Mark. With all three of them possessed, Katherine, Mark, and James confront Ade and Hazel. Ade stays behind to hold off the trio so that Hazel can escape outside. Ade shoots himself in the head before he can become possessed. Hazel hides in the overturned van and is surrounded by the three demons. The ghost of Hazel’s mother unexpectedly appears and destroys Mark and James using supernatural fire. Hazel eventually traps Katherine inside the van, which she then sets on fire. Hazel runs away as Katherine and the van burn, with sirens heard approaching in the distance. Horror movie home invaders have had a hard go of it lately. The “Crush the Skull” (review here) crooks ended up unwittingly trapping themselves inside a serial killer’s lair. The robbers from “Intruders” (review here) weren’t expecting an agoraphobic woman to turn the tables in surprising fashion. And we all know what happened to the thieving trio that took on Stephen Lang in “Don’t Breathe” (review here). The kidnapping quartet of “House on Willow Street,” which may have “From a” in front of its title depending on where and when you see the film, is another criminal crew booking passage on that blunder boat. Moments after taking the hood off their hostage Katherine (Carlyn Burchell, a dead ringer for Hannah Fierman of “V/H/S” (review here) and “Siren”) and spotting some strangely bloodshot eyes, Hazel (Sharni Vinson) wonders if she and her accomplices inadvertently rescued the diamond dealer’s daughter from something far worse than the captivity they had planned. Indeed they did. Hazel’s heist team unknowingly ripped Katherine out of her home right after an exorcism gone awry. Now none of them are going to receive a ransom because there isn’t anyone alive to pay it. What’s worse is that the intruders didn’t just kidnap Katherine. They kidnapped her demon too, and this unholy hellspawn has the ability to bring their worst fears to life as horribly haunting visions. “Average is as average does,” Forrest Gump might say to succinctly sum up “House on Willow Street.” That’s a lame attempt at color, not to mention dated. Frankly, the unremarkable nature of “House on Willow Street” doesn’t inspire my creativity to fire on all cylinders, which is also the case for its screenwriters. For a film unashamed to have a character cry, “C’mon!” at something not moving fast enough, or to have someone reply, “maybe you should be” to a claim that “no one is afraid of the dark,” it’s a mystery why some scenes are structured to be more cumbersome than required. “From a House on Willow Street,” the more accurate of the two titles since a majority of minutes take place away from the titular home, starts with a stakeout and some hemming and hawing over whether to do the kidnapping caper we know will be done anyway. Why not simply insert a throwaway line like, “we spent a month and a half planning this” as the plot is put into motion instead of bothering with a pointless prologue and a “Six Weeks Later” intertitle card? Hazel’s secret connection to the house and the other thieves’ visions of dead family members don’t add up to substantial subplots. A mind idling, which “House on Willow Street” grants plenty of permission to do, might wonder what this demon would do if the transgressors didn’t have traumatic pasts to be taunted with. In the meanwhile, the movie fiddles around with standard spooks of flickering bulbs, audio stings, and tiptoeing down dark corridors lit by slowly sweeping flashlights. “House on Willow Street” might be alright for ‘once in a while’ thriller fans who don’t indulge often in fright flicks that in turn indulge in mid-movie exposition dumps (thank goodness for Katherine’s convenient video diary) and more jump scares than Teddy Roosevelt could shake a big stick at, for wont of a better analogy. The movie certainly looks sharp at least, with moody cinematography and snappy editing elevating atmosphere that an underachieving story has a harder time kicking up. Set expectations for mediocrity and “House on Willow Street” will meet them with a practical presentation for textbook terror. You’re less likely to mind an evaporation of 90 minutes if such disposable horror entertainment is no big taxation on your time. Though if you pause the movie in the middle to take a phone call or grab a bite, it’s 50/50 if you’ll remember to return for the remainder later on. March 28, 2017 by Ian Sedensky.